The Artists’ and Writers’ Cookbook brings together the favourite recipes and culinary secrets of an eclectic group of creatives. Each person has responded in a different way, resulting in a diverse range that stretches between stories, memories, poetry and an excellent recipe for spaghetti carbonara. Ed Ruscha serves up a cactus omelette, Paul Muldoon provides a “recipe for disaster”, Francesca Lia Block gives instructions for how to fall in love, Marina Abramović’s “selections from Spirit Cooking with essential aphrodisiac recipes” has prescriptions for 'pain’ and ‘fire food’. It is thoughtful and intriguing – a cocktail of the literal and the poetic. However, we have just seen the end of 2016 – the year that truth was rebranded as flexible. Everyone lost out, but one of the more unlikely victims was Abramović, whose ‘spirit cooking’ was swept up into the electoral hurricane of Donald Trump vs. Hillary Clinton. Her innocuous email to Tony Podesta inviting him and his brother John to a Spirit Cooking Supper was part of a cache released by Wikileaks,and was translated by unscrupulous media outlets into proof that Podesta, Abramović and Clinton were part of a satanic cult that sacrificed children. 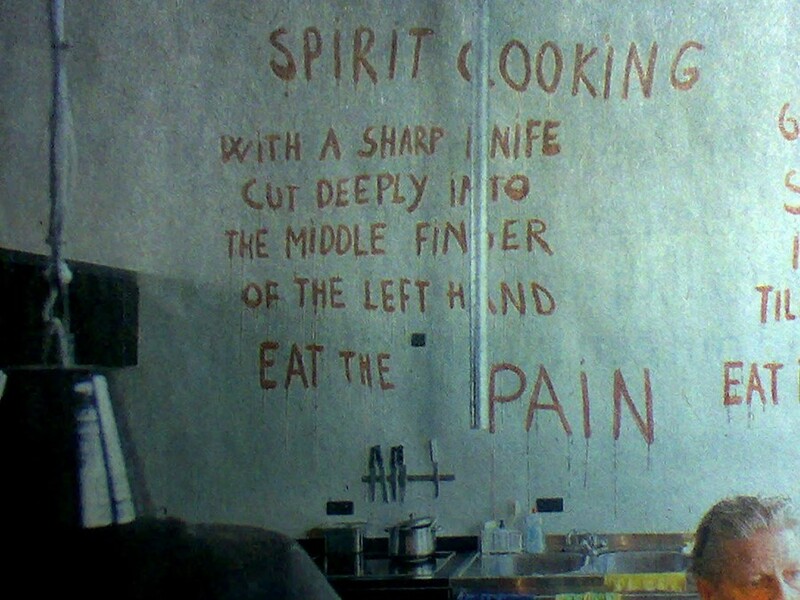 Originally Spirit Cooking was the name of a series of performances that Abramovic debuted in the mid-90s, which included absurdist, poetic recipes which the artist daubed onto walls using various materials, including pigs blood. However, in 2016, the term referred to both a page of poetics in a literary cookbook and a small dinner for high rolling donors to Abramović’s art institution, offering “a night with Marina during which she will teach you… how to cook a series of traditional soups”. It was one of many mad moments in an electoral race defined by its detours away from conventions. In a world where truth no longer mattered, anything – even old artworks from the 1990s – could be wrenched from its moorings and given menacing intent. But in this book we find the right place for Spirit Cooking – set in its rightful context, weaving non-literal ingredients and human stories to make a point about living. The Artists’ & Writers’ Cookbook, edited by Natalie Eve Garrett, is out now published by PowerHouse Books.